Stamp Happy Felicia: What stamp is this? This is just a quick post on this Saturday morning. The sun is SHINING here in Germany. The last few days have been rainy and yucky. I was going through some stamped images I've received and thought this little boy was the cutest thing! Does anyone happen to know who makes this stamp and or what it is called? 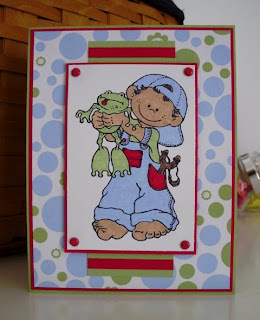 He reminds me of my son Manuel and I would love to be able to purchase this stamp it makes cute little boy cards. I left my card with no sentiment on the front because I'm not sure what I will use it for yet. I don't have very many boy stamps so this was a lot of fun to play with. I threw a little bit of red in with the Certainly Celery & Bashful Blue actually one of the sites I visit gave me this color combo when I put in the two Soft Subtle colors. I really like the pop of red. I hope you are enjoying your weekend! Oh, such a cute card :) Nice colors! The rubber stamps come from "High Hopes Stamps". Great card! I think it's perfect without a sentiment on it. How Adorable, yet not girly! I just love it! I don't know the stamp originator but I do love it. Basful Blue and Certainly Celery are favorite colors of mine. Love how the Real Red just makes the card pop! Very cute card. Love the colours you have used. Hey Felicia - I love this card. I don't have any boy stamps but adore this one. He is so cute !! The colors are so boyish - awesome card!! Felicia, this is a very cute card. Or should I say "handsome" card. I love the image as well. Make sure you post and let us know the info for the image if you find out. It's so darn cute! the coloring is so fitting!! Boys and their *toys*. It reminds me of the days when boys would try to scare us with all these critters! how adorable. glad someone was able to help you with the maker. Your card is darling! I love the image and your coloring is terrific. I was going to say High Hopes as well but I wasn't too sure. They are out of Canada, their prices are awesome (unmounted especially) and are bombarded right now! Shipping is taking about 3 weeks but their images are so cute and worth it. Now on to your card, how cute is it?!? I love your color combo and the layout, very sweet how he is the main focal point. Your coloring is perfect! This card is adorable! Love the frog with his tongue sticking out. Great coloring. I don't know who makes him but he makes an awesome boy card! Very nice work! This is so cute! I love it! I'm sorry I don't know what it is. What a great card for a little boy!! Love the colours and how you have coloured the image. Lovely card. This is so adorable - love that frog! Your coloring is awesome...what did you use? Can't help with the stamps, but plenty have! Love the colours and the spotty paper is gorgeous. I don't know for sure but it reminds me of the High Hopes line too. It sure is adorable!! i LOVE that stamp too! i have never seen it before!! i love this card so much!! Felicia, Very cool card, awesome colors!! He really IS adorable. I love how you colored him! Great card. how cute! prefect card for a mischievous boy :). I have no clue who made the stamp, but it sure is cute! Great card! LOVE LOVE LOVE the new header!!! It's so bright and cheery - made me smile! Hi felicia! I just wanted to stop by and say hi and tell you that I LOVE your new blog layout! SO CUTE!! Beautifuk card and nice colors you choosed. Felicia, Hope your doing ok! Just wanted to say hi! i hope you are okay! Felicia, this card is so cute. I would never have thought of that color combo, so thanks for showing it to us. :) Hope you enjoyed the sun this weekend! This card is so lovely! Your colouring is aweseome too! hi felicia! I hope all is well with you. Just wanted to tell you I've been thinkin' about ya.